The French prime minister says cutting taxes must be a priority, in response to a national debate that focused on the yellow vest protesters' grievances. Edouard Philippe said "the debate clearly shows us in which direction we need to go: we need to lower taxes and lower them faster". The "great debate" involved 10,000 meetings in French community halls and about two million online contributions. Tax cuts have been a key demand of the yellow vest ("gilets jaunes") movement that has taken to the streets in France every weekend since mid-November. 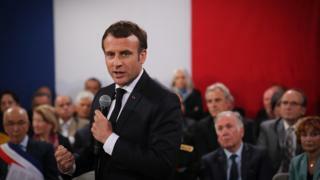 Initially the protesters demanded lower fuel taxes, but the movement quickly morphed into a general rejection of President Emmanuel Macron's economic policies. Mr Philippe said the three-month national debate had highlighted "immense frustration over taxes". One of Mr Macron's least popular measures, early in his presidency, was to scrap a special tax for the wealthy. Yellow vest protesters accuse Mr Macron of protecting the Parisian elite, especially the wealthy, while neglecting the hardship of citizens in the provinces. Mr Philippe said another lesson from the debate was that "the balance must be restored between the cities and the regions". That would include improving transport links between urban and rural areas. There was also public demand for more participatory democracy and more action to tackle climate change, he said.